Ever have one of those days when all you want to do is have a good cry, sit under a blanket, and shut out the problems of the world? I am having one of those today. But, there is not time to sit under the blanket. Instead I have to keep moving forward since this is a busy week. But, my mind still wanders and my heart is heavy. But now it’s just too hard to listen and watch. There are so many stories that I don’t want Ian to hear about without the chance to discuss them with him. Deaths, bombs, shootings, kidnappings, terrorists, and the list goes on. Since we don’t want Ian seeing too much of all of that, my routine has changed drastically. Kirk and I want to be the ones who decide how much he sees and hears. And, to listen to his questions and concerns and be honest with our responses. Also, the hatefulness and continued inaction between Congress and the current President is getting tedious. Why can’t they find a way to work together as happened back when Tip O’Neal was Speaker of the House and Ronald Reagan was President? These two men were on opposite sides of most issues, but still managed to find a way to work together. It seems that those who supposedly care about America would be doing more to make things better. And actually do the work that it takes. Also, the shenanigans of the presidential candidates has been hard to watch. They are mean to one another both within their own party and the other party. They are also mean to the American people. I know they are opponents but could we show some decency? What ever happened to agreeing to disagree? Or to listening to and learning from someone else? Or having a healthy debate but remaining respectful of your opponents? It’s going to be a long year. And, then this morning I found out that a dear friend of ours who is 7 years old will soon be starting chemotherapy and radiation for his brain tumor. We knew this was coming and it is good, yet hard to deal with. He recently had two surgeries to remove the brain tumor. He is the sweetest boy and a friend of Ian’s. My heart goes out for him and his family as he begins this journey. For now, we wait and hope and pray. It will be a tough battle but this boy is strong and has an amazing support system. For that I am very thankful. And, knowing this helps. We also have other friends and family who are sick, or dealing with the deaths of loved ones. With the holidays coming up, all of these things can sometimes be harder to deal with. May we be a support to one another by being there, loving each other, and showing some kindness. And may we pray for one another. With so much darkness in the world, I don’t want Ian growing up thinking that it’s okay to be cruel and mean to someone who doesn’t agree with him. I don’t want him thinking that giving up and not trying are okay. Instead I want him to know there is still decency in the world, as well as kindness and love. And, I want him to know that it is important to always do his best and to work hard. And although there are obstacles in life and sickness, hope still exists and so does the power of prayer and faith. Ian is learning about that from our church and the Bible. He is more aware of many things than I like to sometimes admit. He is an amazing little boy who teaches me things every day. A few silver linings are my son’s innocence and joy of life, my faith, my friends, my family, my routine, and laughter with friends and family. And, funny shows, people, and movies also help. As Truvy said in Steel Magnolias, “laughter through tears is my favorite emotion.” I hope to find that laughter, whether there are tears or not. Now that I have written all of this, I feel the weight lifting and my heart feels less heavy. Sometimes it helps to just get it out, as with a good cry. May you have a blessed day. If you too are feeling sad, remember there are those there to help you and faith is an amazing comfort. God bless! In honor of my cousin Pam’s birthday tomorrow, I decided to post a few photos of fun times with her. She is one of my favorite people on the planet and we always have a great time together. As you can see, we enjoy smiling and silly poses. The picture at the top of the blog is in the beach house kitchen when we were making dinner. Looks like we are making spaghetti and having a blast as usual. I recently came across this photo. She and her hubby came to the house for dinner and to visit with us. It was July 2009. Pam has been a dear friend since we were kids. We don’t see each other regularly but when we do, we always pick up right where we left off. I just love that about us. We have different ideas and opinions on lots of things, but we still enjoy long and lively chats. There is nothing more fun than having a glass of White Zinfandel with her. This is a great time to talk and laugh. This other photo is from another trip to San Diego. It was taken in 2006, before Ian was born. From left are me, Pam, my sister Cindy, and my sister-in-law Beckie. These three gals truly are my sisters. They are all awesome women, great fun, and fantastic mothers. They all love their hubbies and kids as much as I love Kirk and Ian. I love having these strong women in my life. I also have several more awesome cousins who are as fun and special to me as Pam is. And, I am blessed with some wonderful friends and other terrific family members as well. My girlfriends are so very important to me. I only wish that I could see them more than I do. There is nothing like time with female friends and family. Sometimes I just need that time or else things are not right in the world. You know what I mean? Don’t get me wrong, I love the guys in my life, but a gal has to have time to just chat with other gals. This blogs celebrates those amazing women. I am blessed beyond measure to know and love Pam and so many other amazing friends and family. I cherish each of them. Happy early birthday to you Pam! Hope you have a great day. Love you!! It seems that I am just that these days, too busy to write. And, I don’t like that at all. You see, I love to write and since I wonder about so much, there is always something to write about. But, there isn’t always time to write. And, that is something I truly miss. As you see on the calendar on the right of this blog, there aren’t very many entries for this month so far. Life has been so very busy lately and only will get busier as the holidays approach. I just hope to find more time and soon for my writing. Writers are often told that we need to write each and every day. But, is 10 minutes at midnight really going to be something that I will even understand the next day? Probably not. So, I instead write when I have the time to get my coherent thoughts and questions out. There has been much to wonder about lately, that’s for sure. With so much going on in the world, I wonder where we are headed? Will we remain compassionate or will we say no to people and things because our fears take over? Do we who have much appreciate it and live thankful and grateful lives? Or do we take it for granted and complain about everything? Will we dislike others because they are different than us? Or can we work to learn about one another and appreciate those differences? Will we love others and continue to be kind? Will we complain about the design of a cup when there are children starving all over the world and having no access to water? Will we exercise our right to vote and not be criticized by those who don’t agree with us? Will we be able to go to concerts and movies without being fearful? I have a lot of questions and not many answers. And that is frustrating. I hope and pray that we continue to love and help others, yet I know there are those who only know hate, fear, violence, and death. May they not take over our lives and societies. May we with love, kindness, peace, and life be able to spread our message as well. I hope and pray that we can reach out and care for one another. I also hope and pray that we learn to put our differences aside and not be so mean and hateful towards those who disagree with us. May we have compassion for each other. May we be kind. May we be good examples to our children. And, may we love. This is the amazing chorus of “God Bless The USA” by Lee Greenwood. This song gets me every time and is an amazing reminder of the people who sacrifice so much for us. It is what Veterans Day is all about. I so appreciate all men and women who have served to defend our country. These people have included my friends and family. Thanks to them for their service, their sacrifice, and for protecting those they don’t know. This week, the second grade class at Ian’s school is performing a concert in honor of our Veterans. I cannot wait to see these 7- and 8-year-olds sing about patriotism and honor. It will be an amazing sight. They have invited veterans to attend. I hope that a lot will. My prayers are with our veterans both those who made it home and those who gave the ultimate sacrifice. My prayers are also with their families. And, I thank them for all they have done. Hi and Happy Friday. The last two weeks have been crazy busy so I haven’t had any time to write. I hate when that happens. Today, however, I wanted to write a short blog and post a fun picture. On this rainy day, I decided on a photo of toes and sand. 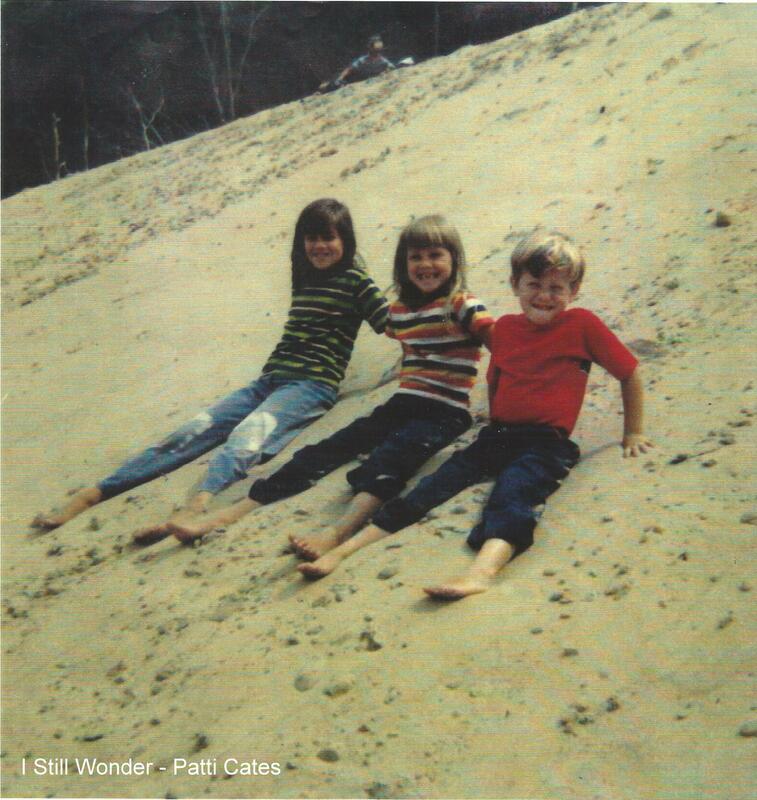 I was sitting on a dune in Michigan with my sister (center) and my brother (right). I love our messy hair, striped t-shirts, big smiles, and bare feet. This was during a family vacation with some friends. We had so much fun on this family vacation. In addition to visiting the dunes, we went on a tour of a Kellogg’s Cereal packaging plant. It was fascinating to see how that process works. We then went back to our friends’ house and created our own plant and enjoyed some free cereal samples. Also on this trip, we went to have a meal in Canada. That was long before passports were needed for a quick trip across the border. We purchased some soft drink bottles while there. They looked so different and were cool souvenirs. We were fortunate to have great family vacations. We regularly went to the family beach house, also went to visit family and friends across the country, and went on camping trips. Mom and Dad always made sure we had a great time. I have many fond memories of this vacations. Now, Kirk, Ian, and I have enjoyed several fun vacations and the first of many camping trips. My favorite place to go with these two continues to be the beach house. They seem to have as much fun as I do. I wonder what our Friday has in store for us? I know it will be rainy but warm. So it will be a good time to enjoy being home. I am so looking forward to that.